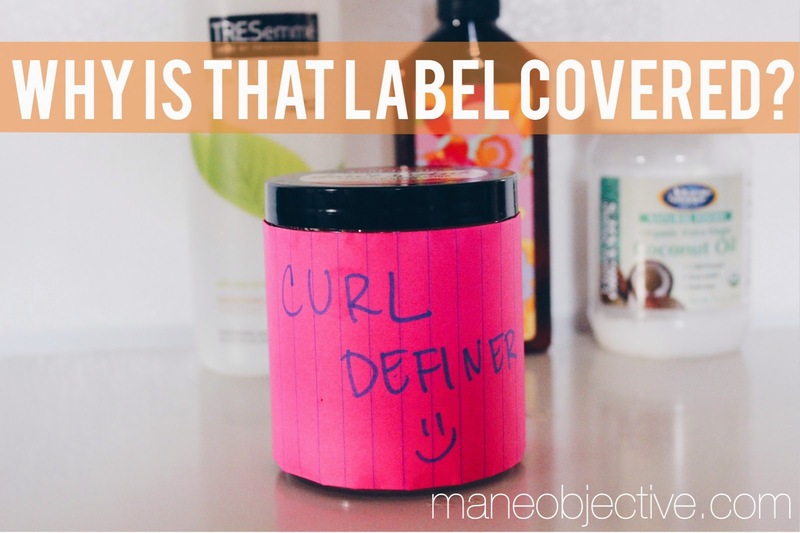 The Mane Objective: Why is That Label Covered? Top-Secret Product or #TeamPetty? Why is That Label Covered? Top-Secret Product or #TeamPetty? Spoiler alert: it's not a top secret product. I've been sitting on this blog post for quite some time now, as you'll learn in a few. Before I hit that "publish" button, I had to ask myself several questions (and give myself several answers). What negative repercussions could possibly fall back on you? I'm doing this because I'm frustrated, my blog is my outlet, and of course I always keep it 100 with you guys -- I share the good and the not-so good. I don't know what negative repercussions could come as a result of this post, but it's a chance I'm willing to take. Publishing this post goes against everything the "big time" bloggers and vloggers say -- but I'm not here to tread lightly and play patty-cake out of fear of what might happen. This post isn't about dragging a brand for the filth, it's about being honest about my experience as a former customer. I'm doing this because I feel as a consumer, as someone who easily spends hundreds of dollars annually on hair products, that I deserve more respect. It has little to nothing to do with the fact that I'm a blogger. As far as I'm concerned, I'm a product junkie that just so happens to have a platform. I really do wish there was another way -- but I've exhausted the options at my disposal. I sent e-mails. I even called and left a voicemaill. I don't want to be extra petty and leave messages on their social media accounts (I don't think that's cool + their Instagrams have been inactive for 14 and 26 weeks -- so clearly, no one is manning them anyway). I'm closing the chapter here, with this blog post. I've long since stopped purchasing their products anyway. Reservations notwithstanding, I WAS STILL DOWN FOR PURCHASING THE PRODUCT thereafter, solely based on the performance and price point. I thought it was a good, fair review. I gave you all what I normally give you -- the good, the bad, the awesome, and the not-so awesome. I thought the review was pretty straightforward and favorable. Did you? Do YOU SEE where it says Shea Butter & Extra Virgin Olive Oil? I'm honestly glad I didn't bother with the extra effort to mail them the label, because at this point I strongly doubt they would have followed through on their end. 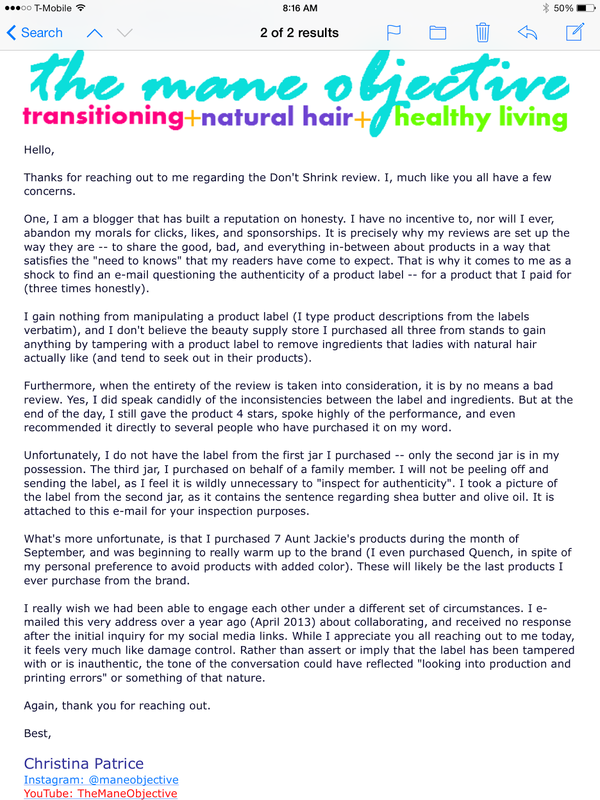 In November, I followed up with them again, on account of me discovering another photo of the label on social media, and cross-referencing my label, that label, and the one listed on Naturally Curly. Still, no answer. About 2 weeks ago, I called their customer service number, left a message, and have yet to get a return call. Maybe I should have left a fake name instead of Christina. Shrug. Can I be real with y'all for a minute? Aunt Jackie's//House of Cheatham will never see another coin from me. I have not purchased a product from them since September 2014, and will continue to refuse to support them. That's why the label is covered. This is not to toot my own horn in any way, but I do understand that many of you have grown to trust me as a resource for information and product reviews. I get A LOT of questions about recommended products, and many of you have told me that you purchased a product solely on my review. That level of trust and love, I appreciate and NEVER want to abuse. So when I covered the Don't Shrink label, I did so as a matter of principle. 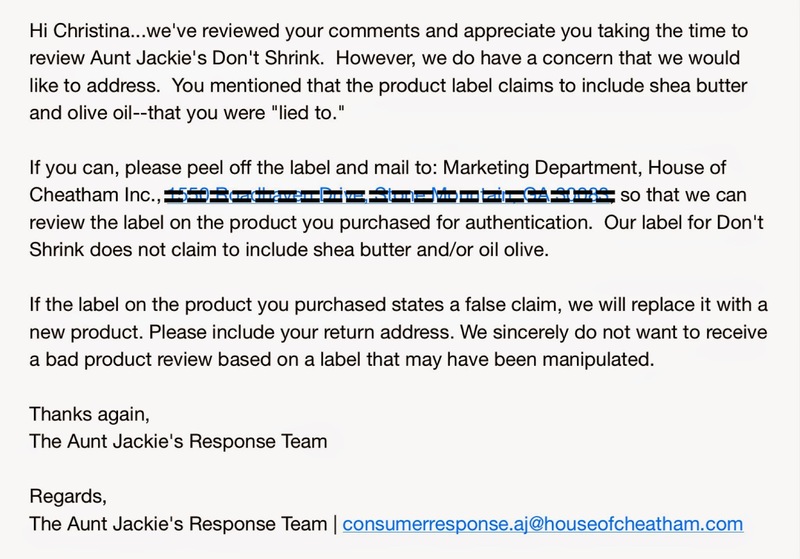 I do not support Aunt Jackie's//House of Cheatham, and I refuse to acknowledge their brand in anything I do moving forward. I spent the money on the Don't Shrink back in September and I can't get a refund, so I have no choice but to use the product up. What I refuse to do is promote a brand to you all that has disrespected and ignored me as a consumer. Although I was initially offended by the e-mail, what really grinds my gears is how they paid me dirt. There is no way in hell a PAYING CUSTOMER should have to pursue you 3-4 times about YOUR PRODUCT. That's just bad business. I've had issues with products before, and the owners of the brand have always responded promptly and efficiently. But Aunt Jackie's//House of Cheatham has taken it upon themselves to not even provide me with a "K."...and I am here for absolutely none of that. What it boils down to is accountability. I made mention of an inconsistency on their label, and as a consumer, it's not my job to figure out what went wrong. Whether someone was asleep at the editing desk or not before the labels went to print is none of my business. The idea that somebody has enough time to tamper with product labels and slang bootleg curl gel is ludicrous. Gray market products do exist, but not for $8 gel. For all I know, I could have chanced upon and caught them in some serious marketing deception -- but I like to try and give companies the benefit of the doubt. Regardless of what actually happened or why the labels are as they are, the fact still remains that they chose not to respond to me. This is me holding Aunt Jackie's//House of Cheatham and other brands accountable for the things they say and do. These companies that cater to natural hair would be nothing without you all as customers (and me too) going out and putting our hard-earned money on the counter to purchase their products. We are one of the fastest-growing market segments in hair and beauty, which is why so many companies continue to churn out products that cater to us. I'm okay with companies trying to come for our coin, but I refuse to let them play me or you in the process. Make no mistakes, I'm not here to tell you what to do with your money. If you like Aunt Jackie's products, then by all means, do you. I'm just letting you know where my money WON'T be going, because I refuse to be curved and still shell out money. I just want to make sure you know that if you do have an unfavorable experience with a company, you have a voice. Your voice (and your money) matters. Have you had a bad experience with a brand? How did you get it resolved? Share below! I remember you posting about this. Even though I've been curious about the product I can't deal with product lines I can't trust. I work way too hard for my money to hand it over to a company that's so careless. Ever think about creating your own product line? My only disagreement with your article is this business about sending them the label. You already paid for the product. They want YOU to go out your way peeling off a label and mailing it to them? Sending them photos doesn't work? Better yet, how don't they know what label is on their product? That all sounds crazy to me. I don't think their request was reasonable and good for you for letting the rest of us know. We work too hard for our coins to play with people that we purchase from. Loveeed your email. Very well said, very well written. This is why I always come back to your blogs and watch your vids! You are always honest. Thank you for taking your time out to follow up on things. It's funny how you try to support people and they call you the enemy when they are wrong. They might as well be a boyfriend that cheated and got caught with photos from a private investigator and still denying to truth. I'm sure that this is done all of the time. THX again! I appreciate this blog post. It, and especially the correspondence included, is clear and well written. It is unfortunate that certain brands do not understand the meaning of customer service and take over 72 hours to respond to an inquiry. If you contact zulily (for example) they will get back to you in less than 48 hours. I had a run in with simplicity oil in regards to a sales tax issue and the initial 24hr response time escalated to 3+ business days. Long story short the sales tax explanation that was eventually provided shouldn't have taken so long to give. RIGHT! I'm with you. I'd much rather take my money where it will be appreciated. I have toyed with the idea of creating a product line or collaborating with an already existing brand. We will have to see what 2016 holds! LOL! What's funny is that prior to my idea of slapping another piece of paper in front of the label, I started trying to peel it off so the jar would just be blank. It was SUPER difficult! I was like, if I can't get this sucker off for me, why would I bother trying for you? A MESS!! And not be shifty when they do respond. Love your article! Appreciate the honesty & transparency! 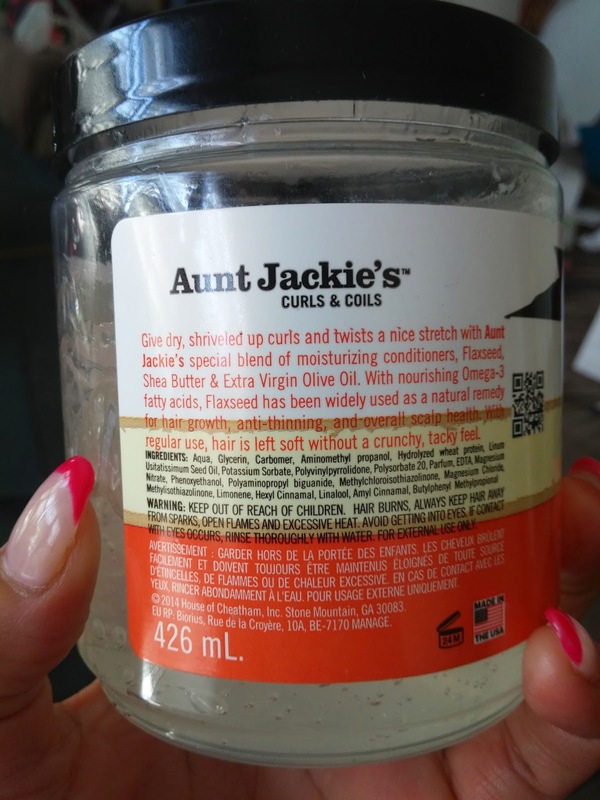 I purchased Aunt Jackie's Curl La La Defining Curl Custard. It was my first & last purchase of that brand. My daughter & I both have natural hair & it made our hair look like it had white specs throughout when I used it on our wash & go. Also, on a separate occasion we used it as a refresh on day 2 hair and it made our hair look dirty. Highly disappointed! Miss Patrice! I told you that I love your integrity and real ness...THIS is exactly why. I bought their ooh la la curl cream a couple of times but really didn't like the purple color lol and went back to SM and Edens. I can't see either of those brands responding as this company did...and so... Yeah. In any case, let the water works begin! Hahaha! Thank you! I was at the BSS earlier in the week and saw this. I was about to give this a pass because of the price, even though I'm not too cool on carbomer based gels. Fortunately I Googled it on my phone saw your review and put it back on the shelf. I believe your concern is real!! Thanks for posting! With this post you've officially become my favorite Natural Hair blogger. In all honesty if you were a "bigger" blogger in their eyes, I bet they wouldn't have treated you the way they did. Influence aside b/c none of that matters to me, they have a lot of nerve to do the most then accuse you. 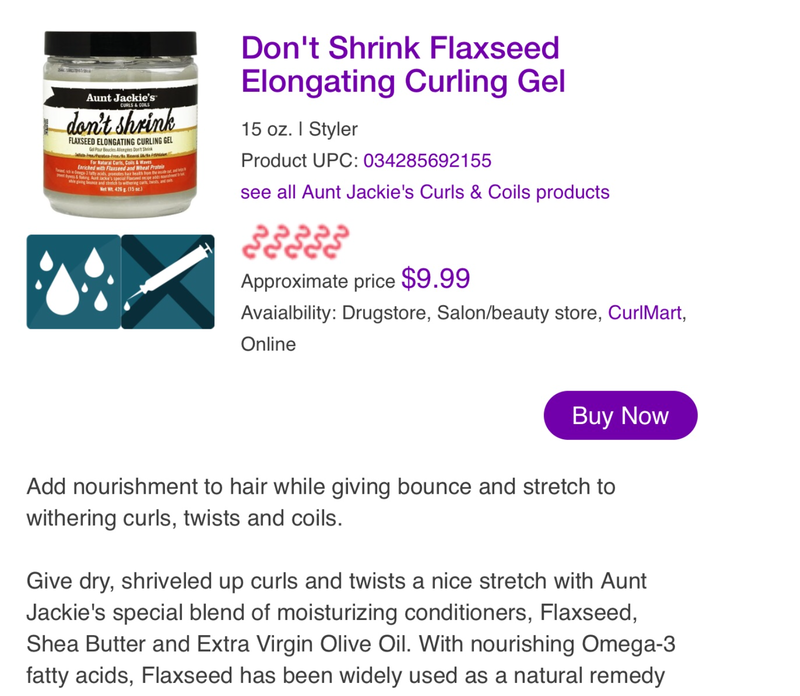 I actually liked Aunt Jackie's shampoo too but I don't like it when companies can't or don't know how to handle a less than stellar review and yours wasn't even bad! I'm glad you could put politics aside and be real. As I mentioned before I was familiar with Aunt Jackie's via the shampoo and detangler. I saw the gel for $6 at my beauty supply store numerous times and it was your review that pulled the trigger. I'm on the east coast and I still have my jar so I can say Aunt Jackie's tried it, there is nothing wrong with the label and nobody is tampering with it because the picture you took is exactly what mine says. Who the heck says the customer is wrong by accusing them of lying AND tampering!! Aunt Jackie's has lost my business for violating Customer Service 101: you never confront the customer point blank as being wrong. I read you email and I was dying. I thought it was hilarious because they probably thought you were gullible or some foolishness like that. Maybe they're taking so long to respond because they don't know how; they're still trying to get over the punch of your email. I do think that they could have responded better to your inquiry, maybe when they saw that review, they could have actually looked at their products or even on the down low reformulated the product so that it did, in fact, include the products they claim it has. I wonder what their response is going to be now. I mean, if a product works, it works. There's no need to cheat. there are a lot of products out there that aren't made with juices and berries and are one ingredient away from being a plastic or laundry detergent, but they work. They just need to understand who their audience is and market to them. Not everyone is all about the all natural route, and they will get money for their product without lying. But you know, Christina, you gots yo supporters. SO it be a'iight. Thank you Shontae!!!! I'm still waiting on a reply...LOL! At this point I don't think I'll ever get one, and I'm cool with that. You speak 137% TRUTH on that "one ingredient away from being a plastic or laundry detergent"... YES!!! Thank you again for the love. Thank you Lex!!!!! I think the same thing too -- if I were a Mo Knows Hair or Mahogany Curls, they would have come all sorts of correct. But because I'm lil ol' Christina Patrice, they can say or do whatever. It's okay though, because companies that operate like this always get what's coming to them. There are too many other quality, competitive brands that deserve my coins. Thank you again for your support, Lex. I appreciate you!!! Thank you, #BLMGirl! I'm so glad to know I'm not the only one who feels this way. Thank you!!!! Eden, Shea Moisture, TGIN, heck...ANY other brand wouldn't dare do this to a paying customer. Thank you for your honesty!!! I'm so glad I didn't keep going with their products -- that Curl La La was next! White specks --ugh! Sorry you had to deal with that! I know this post is old but I am not feeling Aunt Jackie's either. I emailed them about their quench leave-in, asking them about the consistency and feel of the product and they have yet to get back to me. That was 3 months ago when I bought it. The leave-in was really watery and got a little foamy/lathery when I used it (I like to use a lot of leave-in on my hair). I asked them if it was supposed to be like that or if I'm using too much but they couldn't answer something as simple as that. I emailed them 4 times. I'm kinda peeved that I have no answers regarding their product and had to resort to asking my fellow curlies. I refuse to buy anything from anyone with bad customer service. Even though I had no qualms about the gel, I will not be buying it again.